Several years ago we created a Feed the Monster game out of a cardboard box that was a hit with my kids. This week for LEGO WEEK we decided to adapt it a bit and use LEGO bricks for "food." 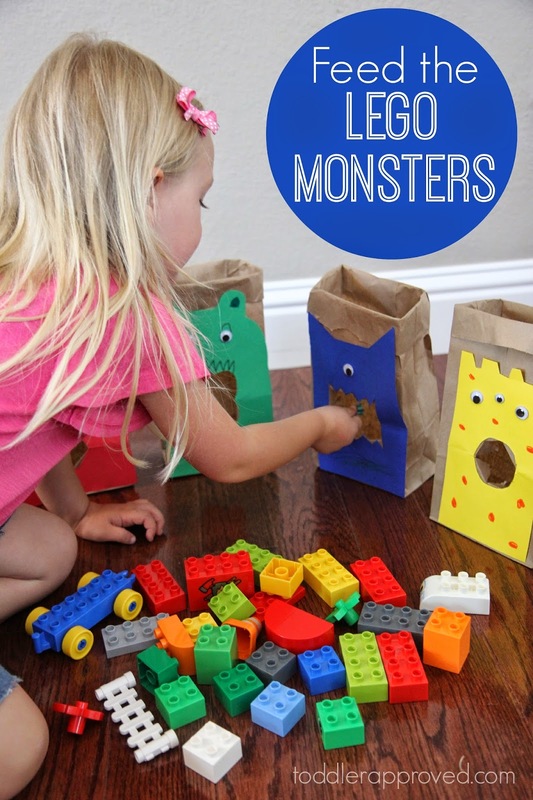 Our Feed the LEGO Monsters activity is a simple color sorting and building game for kids ages 3+ though kids that are younger may enjoy this activity too. My favorite component of this activity was the building game, so make sure to scroll down and read what we did after we sorted the bricks. Materials needed: brown paper bags, scissors, cardstock, markers, double stick tape, googly eyes, LEGO DUPLO and regular LEGO bricks. To start I cut out several monster bodies from colored cardstock and then taped them to brown paper bags. I also rolled the top of the brown paper bags down to make them easier to stuff with LEGO bricks. After the monsters we stuck to the bags, I made a few snips in the centers of the mouthes and pushed them through so that each of the monsters had a useable mouth. Next we grabbed googly eyes and markers to decorate the monsters. We used double stick tape for the googly eyes instead of glue. Once the monsters were finished we set them up and added a pile of LEGO DUPLO bricks and we were ready to start sorting the bricks by color! My 3-year-old LOVED this activity! Some of our cute 6-year-old friends that were over also saw the activity and wanted to join in. She sorted until we ran out of bricks and then found more and sorted them until all of the monsters were filled to the brim and very full from all the "food!" Our favorite part of this activity was the building part! After we were done sorting, each child got to choose a monster bag. Then they took their monster bag to the carpet, dumped out the LEGO bricks, and had to create something using all of their colored LEGO bricks. My daughter got really into this activity and built for awhile. I chose a bag and made my own creation as well. As you can tell from this photo, my daughter was super proud of her LEGO creation. Have you done any other LEGO sorting activities with your kids? What are some other ways that you use LEGO bricks for playful learning? Don't forget to head over to our LEGO Week series page to check out all of the other great LEGO posts we'll be sharing from our blogging friends this week. Our favorite was the Sensory Play with LEGO bricks we shared on Wednesday. Good idea. I will try this soon!